Ever wonder why you get a fever when you’re sick? Fever is your body’s way of fighting an illness. When you’re sick, compounds caused by bacteria send a message to your hypothalamus, a small part of your brain that acts like your body’s thermostat. Heating your body up is one way of destroying those pesky bacteria that make you sick. When you’re sick, a fever can prevent bacteria from multiplying so you get well faster. Fevers can sometimes be caused by other things like sun stroke. Have you ever noticed that you feel very warm when you have a sunburn? Normal body temperature is right around 98.6. A temperature above 100 is considered a fever. Kids tend to get fevers more than adults. Your normal body temperature is usually lowest early in the morning and highest in the afternoon. A low fever can be a good thing, but a high fever can cause problems, such as seizures or delirium. Not only that, a high fever usually makes parents freak out! When you have a fever, the best thing to do is rest. Drink plenty of fluids, but don’t eat much. Chances are, you won’t be hungry anyway. Your parents will probably give you medicine so the fever doesn’t go too high. In some cases, your parents might give you a bath in lukewarm water or place a cool, damp cloth on your head. Find out when a fever is serious and when it’s nothing to worry about. Declan, Tobin. " 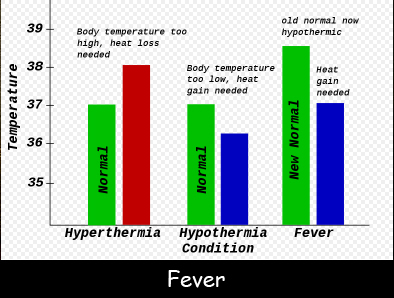 Fever Facts for Kids – Causes ." Easy Science for Kids, Apr 2019. Web. 18 Apr 2019. < https://easyscienceforkids.com/fever/ >.